Tue., Feb. 20, 2018, 9:01 a.m.
GOODYEAR, Ariz. – Francisco Lindor changed his hair color. He can’t shake the sting from October. Even months after Cleveland’s unexpected loss to the New York Yankees in the AL playoffs, the Indians All-Star shortstop is anguished by a season that seemed headed toward a World Series title. Now, the Indians begin anew, intent on accomplishing more than they did in 2017, when they won the AL Central, reeled off a league-record 22 straight wins and led 2-0 in the division series before crumbling. The 24-year-old Lindor arrived at camp with his hair dyed platinum grey, a look that prompted heads to turn and triggered a fair share of ribbing from teammates. He’s coming off another solid season in which he batted .273 with 33 home runs, 89 RBIs and played his position at an elite level. He finished fifth in the MVP vote. He’s also noticeably stronger, his body far more muscular than in past years. Before their first on-field workout, Indians manager Terry Francona delivered a familiar talk to his team, which lost a couple big pieces. Lindor knows the speech by heart. “It was the same thing he does every year – respect the game, respect the clubhouse, respect the people around you and don’t back down from anything,” he said. While the Indians are favored to defend their division title, there are holes to fill. Seven players left as free agents, including first baseman Carlos Santana, outfielder Jay Bruce and relievers Bryan Shaw and Joe Smith. Cleveland’s core – Lindor, All-Star second baseman Jose Ramirez, Cy Young winner Corey Kluber and elite relievers Andrew Miller and Cody Allen – remains intact. Lindor believes the club’s chances for winning its first title since 1948 remain strong. On Sunday, the team re-signed outfielder Rajai Davis, who hit the game-tying home run in the ninth inning of Game 7 in the 2016 series, and Cleveland added free-agent first baseman Yonder Alonso to offset the power drain caused by the loss of Santana and Bruce. Lindor has already bonded with Alonso, who hit a career-high 28 homers last season after changing his swing. 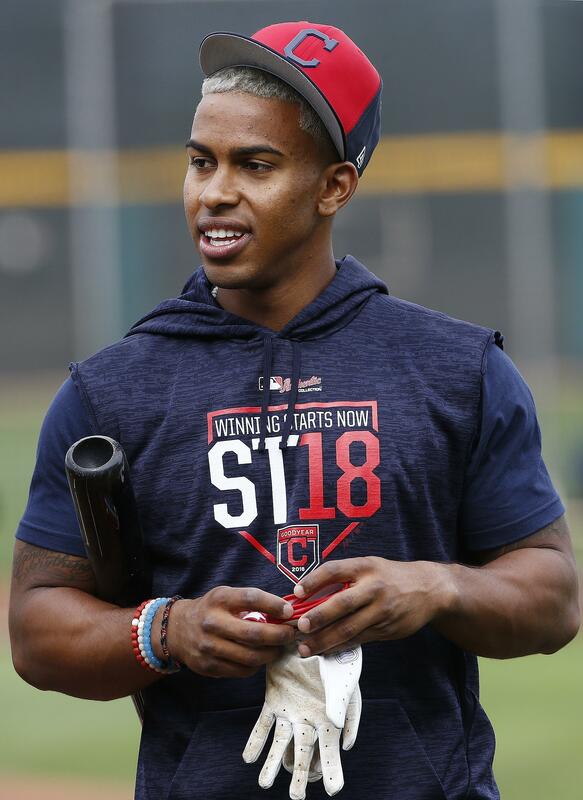 Lindor has also been excited to see outfielder Michael Brantley back in the batting cage as he recovers from ankle surgery. Brantley was unable to help the Indians last October, when Cleveland didn’t finish the way Lindor wanted. Published: Feb. 20, 2018, 9:01 a.m.